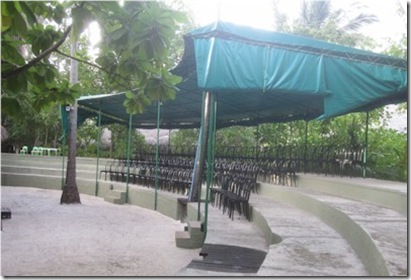 You just never know what you are going to stumble upon in the Maldives. The stereotype is that there is nothing to do there but lie in the sun and swim in the sea. But every time I visit there I’m always taken aback by some undiscovered curiosity. Most of the time the resorts themselves don’t even realise the unique assets they possess. 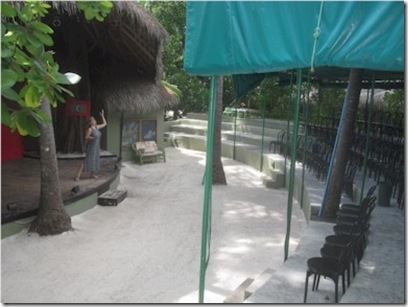 Probably the most ‘surprising’ of my recent tour was the outdoor theatre at Adaaran Club Rannalhi. Our tour was finished and we were wrapping up when we rounded the corner and lo and behold we came upon an outdoor amphitheatre. Definitely up there with a glowing hatch and a polar bear for things you would not expect to see on a tiny deserted island…it was definitely ‘Lost’ moment. In this case, the ‘Others’ are an Italian tour operater called Azemar who book many ‘club’ style holiday packages to ‘Club’ Rannalhi. In inimitable Italian style, the tour operators stage all sorts of spectacles from drama to singing to presentations. The stage is sheltered (probably more against the sun than rain), has lighting, screens and a range of theatrical and AV support. I wrote about the innovative work Sheraton Full Moon was doing in the corporate space, but if you wanted to bring a really large crowd down and have a facility for big group presentations, Club Rannalhi could actually fit the bill. I think that the idyllic beauty of the Maldives might even make a Powerpoint deck palatable.